Examples of omnivores. 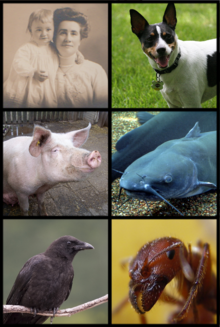 From left to right: Humans, dogs, pigs, walking catfish, American crow, gravel ant. An omnivore (/ˈɒmnɪvɔːr/) is an animal that has the ability to eat and survive on both plant and animal matter. Obtaining energy and nutrients from plant and animal matter, omnivores digest carbohydrates, protein, fat, and fiber, and metabolize the nutrients and energy of the sources absorbed. Often, they have the ability to incorporate food sources such as algae, fungi, and bacteria into their diet. Omnivores come from diverse backgrounds that often independently evolved sophisticated consumption capabilities. For instance, dogs evolved from primarily carnivorous organisms (Carnivora) while pigs evolved from primarily herbivorous organisms (Artiodactyla). What this means is that physical characteristics are often not reliable indicators of whether an animal has the ability to obtain energy and nutrients from both plant and animal matter. Owing to the wide range of entirely unrelated organisms independently evolving the capability to obtain energy and nutrients from both plant and animal materials, no generalizations about the anatomical features of all omnivores can realistically be made. The variety of different animals that are classified as omnivores can be placed into further categories depending on their feeding behaviors. Frugivores include maned wolves and orangutans; insectivores include swallows and pink fairy armadillos; granivores include large ground finches and mice. All of these animals are omnivores, yet still fall into special niches in terms of feeding behavior and preferred foods. Being omnivores gives these animals more food security in stressful times or makes possible living in less consistent environments. The word omnivore derives from the Latin omnis (all), and vora, from vorare, (to eat or devour), having been coined by the French and later adopted by the English in the 1800s. Traditionally the definition for omnivory was entirely behavioral by means of simply "including both animal and vegetable tissue in the diet." In more recent times, with the advent of advanced technological capabilities in fields like gastroenterology, biologists have formulated a standardized variation of omnivore used for labeling a species' actual ability to obtain energy and nutrients from materials. This has subsequently conditioned two context specific definitions. The taxonomic utility of omnivore's traditional and behavioral definition is limited, since the diet, behavior, and phylogeny of one omnivorous species might be very different from that of another: for instance, an omnivorous pig digging for roots and scavenging for fruit and carrion is taxonomically and ecologically quite distinct from an omnivorous chameleon that eats leaves and insects. The term "omnivory" is also not always comprehensive because it does not deal with mineral foods such as salt licks and the consumption of plant and animal material for medical purposes which would not otherwise be consumed (i.e. zoopharmacognosy) within non-omnivores. Though Carnivora is a taxon for species classification, no such equivalent exists for omnivores, as omnivores are widespread across multiple taxonomic clades. The Carnivora order does not include all carnivorous species, and not all species within the Carnivora taxon are carnivorous. It is common to find physiological carnivores consuming materials from plants or physiological herbivores consuming material from animals, e.g. felines eating grass and deer eating birds. From a behavioral aspect, this would make them omnivores, but from the physiological standpoint, this may be due to zoopharmacognosy. Physiologically, animals must be able to obtain both energy and nutrients from plant and animal materials to be considered omnivorous. Thus, such animals are still able to be classified as carnivores and herbivores when they are just obtaining nutrients from materials originating from sources that do not seemingly complement their classification. For instance, it is well documented that animals such as giraffes, camels, and cattle will gnaw on bones, preferably dry bones, for particular minerals and nutrients. Felines, which are usually regarded as obligate carnivores, occasionally eat grass to regurgitate indigestibles (e.g. hair, bones), aid with hemoglobin production, and as a laxative. Occasionally, it is found that animals historically classified as carnivorous may deliberately eat plant material. For example, in 2013, it was considered that American alligators (Alligator mississippiensis) may be physiologically omnivorous once investigations had been conducted on why they occasionally eat fruits. It was suggested that alligators probably ate fruits both accidentally but also deliberately. "Life-history omnivores" is a specialized classification given to organisms that change their eating habits during their life cycle. Some species, such as grazing waterfowl like geese, are known to eat mainly animal tissue at one stage of their lives, but plant matter at another. The same is true for many insects, such as beetles in the family Meloidae, which begin by eating animal tissue as larvae, but change to eating plant matter after they mature. Likewise, many mosquito species in early life eat plants or assorted detritus, but as they mature, males continue to eat plant matter and nectar whereas the females (such as those of Anopheles, Aedes and Culex) also eat blood to reproduce effectively. Although cases exist of herbivores eating meat and carnivores eating plant matter, the classification "omnivore" refers to the adaptations and main food source of the species in general, so these exceptions do not make either individual animals or the species as a whole omnivorous. For the concept of "omnivore" to be regarded as a scientific classification, some clear set of measurable and relevant criteria would need to be considered to differentiate between an "omnivore" and other categories, e.g. faunivore, folivore, and scavenger. Some researchers argue that evolution of any species from herbivory to carnivory or carnivory to herbivory would be rare except via an intermediate stage of omnivory. Various mammals are omnivorous in the wild, such as species of pigs, badgers, bears, coatis, civets, hedgehogs, opossums, skunks, sloths, squirrels, raccoons, chipmunks, mice, and rats. Hominidae, including humans and chimpanzees, are also omnivores. Most bear species are omnivores, but individual diets can range from almost exclusively herbivorous to almost exclusively carnivorous, depending on what food sources are available locally and seasonally. Polar bears are classified as carnivores, both taxonomically (they are in the order Carnivora), and behaviorally (they subsist on a largely carnivorous diet). Depending on the species of bear, there is generally a preference for one class of food, as plants and animals are digested differently. Wolf subspecies (including wolves, dogs, dingoes, and coyotes) eat some plant matter, but they have a general preference and are evolutionarily geared towards meat. Also, the maned wolf is a canid whose diet is naturally 50% plant matter. While most mammals may display "omnivorous" behavior patterns depending on conditions of supply, culture, season and so on, they will generally prefer a particular class of food, to which their digestive processes are adapted. Like most arboreal species, most squirrels are primarily granivores, subsisting on nuts and seeds. But like virtually all mammals, squirrels avidly consume some animal food when it becomes available. For example, the American eastern gray squirrel has been introduced by humans to parts of Britain, continental Europe and South Africa. Where it flourishes, its effect on populations of nesting birds is often serious, largely because of consumption of eggs and nestlings. Various birds are omnivorous, with diets varying from berries and nectar to insects, worms, fish, and small rodents. Examples include cassowaries, chickens, crows and related corvids, keas, rallidae, and rheas. In addition, some lizards, turtles, fish (such as piranhas and catfish), and invertebrates are also omnivorous. Quite often, mainly herbivorous creatures will eagerly eat small quantities of animal food when it becomes available. Although this is trivial most of the time, omnivorous or herbivorous birds, such as sparrows, often will feed their chicks insects while food is most needed for growth. On close inspection it appears that nectar-feeding birds such as sunbirds rely on the ants and other insects that they find in flowers, not for a richer supply of protein, but for essential nutrients such as cyanocobalamin that are absent from nectar. Similarly, monkeys of many species eat maggoty fruit, sometimes in clear preference to sound fruit. When to refer to such animals as omnivorous, or otherwise, is a question of context and emphasis, rather than of definition. ^ Beasley, DeAnna; Koltz, Amanda; Lambert, Joanna; Fierer, Noah; Dunn, Rob (29 July 2015). "The Evolution of Stomach Acidity and Its Relevance to the Human Microbiome". PLOS ONE. 10 (7): e0134116. doi:10.1371/journal.pone.0134116. PMC 4519257. PMID 26222383. ^ Dewey, T. & Bhagat, S. (2002). "Canis lupus familiaris". Animal Diversity Web. Retrieved 3 April 2016. ^ Brooker RJ (2008). Biology. McGraw-Hill. p. 1326. ISBN 0072956208. ^ Pond G, Ullrey DE, Baer CK (2018). Encyclopedia of Animal Science - (Two-Volume Set). McGraw-Hill. p. 1350. ISBN 0072956208. ^ Bradford, Alina (25 January 2016). "Reference: Omnivores: Facts About Flexible Eaters". Livescience. Retrieved 2 April 2016. ^ a b "Omnivore". National Geographic Education. National Geographic Society. 2011-01-21. Retrieved 4 October 2012. ^ a b McArdle, John. "Humans are Omnivores". Vegetarian Resource Group. Retrieved 6 October 2013. ^ "Why Your Dog's Pedigree Goes Back 40 Million Years". About.com Education. Retrieved 2 April 2016. ^ "Evolutionary History of Pigs – Domesticating Wilbur". blogs.lt.vt.edu. Retrieved 2 April 2016. ^ "Order Cetartiodactyla - Even-toed ungulates (and whales)". www.ultimateungulate.com. Retrieved 2 April 2016. ^ "omnivore | biology". Encyclopædia Britannica. Retrieved 2 April 2016. ^ Motta-Junior, J. C.; Talamoni, S. A.; Lombardi, J. A.; Simokomaki, K. (1 October 1996). "Diet of the maned wolf, Chrysocyon brachyurus, in central Brazil". Journal of Zoology. 240 (2): 277–284. doi:10.1111/j.1469-7998.1996.tb05284.x. ISSN 1469-7998. ^ Galdikas, Biruté M. F. (1 February 1988). "Orangutan diet, range, and activity at Tanjung Puting, Central Borneo". International Journal of Primatology. 9 (1): 1–35. doi:10.1007/BF02740195. ISSN 0164-0291. ^ McCarty, John P.; Winkler, David W. (1 January 1999). "Foraging Ecology and Diet Selectivity of Tree Swallows Feeding Nestlings". The Condor. 101 (2): 246–254. doi:10.2307/1369987. JSTOR 1369987. ^ Superina, Mariella (1 March 2011). "Husbandry of a pink fairy armadillo (Chlamyphorus truncatus): case study of a cryptic and little known species in captivity". Zoo Biology. 30 (2): 225–231. doi:10.1002/zoo.20334. ISSN 1098-2361. PMID 20648566. ^ "For Most Of Human History, Being An Omnivore Was No Dilemma". NPR.org. Retrieved 3 April 2016. ^ "omnivore: definition of omnivore in Oxford dictionary (American English) (US)". www.oxforddictionaries.com. Retrieved 2 April 2016. ^ Collocott, T. C., ed. (1974). Chambers Dictionary of science and technology. Edinburgh: W. and R. Chambers. ISBN 978-0-550-13202-4. ^ a b "Omnivore - Biology-Online Dictionary". www.biology-online.org. Retrieved 2 April 2016. ^ a b "omnivore - definition of omnivore in English from the Oxford dictionary". www.oxforddictionaries.com. Retrieved 2 April 2016. ^ "Definition of OMNIVORE". www.merriam-webster.com. Retrieved 2 April 2016. ^ "omnivore Definition in the Cambridge English Dictionary". dictionary.cambridge.org. Retrieved 2 April 2016. ^ Clarys, Peter; Deliens, Tom; Huybrechts, Inge; Deriemaeker, Peter; Vanaelst, Barbara; De Keyzer, Willem; Hebbelinck, Marcel; Mullie, Patrick (24 March 2014). "Comparison of Nutritional Quality of the Vegan, Vegetarian, Semi-Vegetarian, Pesco-Vegetarian and Omnivorous Diet". Nutrients. 6 (3): 1318–1332. doi:10.3390/nu6031318. ISSN 2072-6643. PMC 3967195. PMID 24667136. ^ Reece, Jane (10 November 2013). Campbell Biology (10th Edition). Boston: Pearson. pp. Chapter 55. ISBN 978-0321775658. ^ "Animals: Carnivore, Herbivore or Omnivore?". science made simple. 2014-02-27. Retrieved 2 April 2016. ^ Ewer, R. F. (1973). The Carnivores. London: Weidenfeld and Nicolson. ISBN 978-0-297-99564-7. ^ "Why Dogs Eat Grass ~ Dr. Richard Orzeck". www.worldsvet.com. Retrieved 17 April 2016. ^ "White-tailed deer shown to raid nests, eat eggs and baby birds, USGS reports". NOLA.com. Retrieved 17 April 2016. ^ Hutson, Jarod M.; Burke, Chrissina C.; Haynes, Gary (1 December 2013). "Osteophagia and bone modifications by giraffe and other large ungulates". Journal of Archaeological Science. 40 (12): 4139–4149. doi:10.1016/j.jas.2013.06.004. ^ petMD. "Why do cats eat grass?". petMD. Retrieved 17 April 2016. ^ Platt, S. G.; Elsey, R. M.; Liu, H.; Rainwater, T. R.; Nifong, J. C.; Rosenblatt, A. E.; Heithaus, M. R.; Mazzotti, F. J. (2013). "Frugivory and seed dispersal by crocodilians: an overlooked form of saurochory?". Journal of Zoology. 291 (2): 87–99. doi:10.1111/jzo.12052. ISSN 1469-7998. ^ "Omnivore". www.eoearth.org. Retrieved 3 April 2016. ^ Maclean, Gordon Lindsay (1993). Roberts' Birds of Southern Africa. Publisher: New Holland. ISBN 978-0620175838. ^ Skaife, S. H. (1953). African Insect Life. Pub. Longmans, Green & Co., London. ^ "Anopheles Male Vs. Female". animals.mom.me. Retrieved 17 April 2016. ^ Singer, Michael S.; Bernays, Elizabeth A. (2003). "Understanding Omnivory Needs: A Behavioral Perspective". Ecology. 84 (10): 2532–2537. doi:10.1890/02-0397. ^ "Omnivores' ancestors primarily ate plants, or animals, but not both". 2012-04-17. Retrieved 17 April 2012. ^ Brent Huffman. "Family Suidae (Pigs)". UltimateUngulate.com. Retrieved 29 December 2007. ^ "Tree Squirrels". The Humane Society of the United States. Archived from the original on 25 December 2008. Retrieved 1 January 2009. ^ "Eastern Chipmunk". Wonder Club. Retrieved 1 January 2009. ^ "Florida Mouse". United States Fauna. Archived from the original on 29 August 2007. Retrieved 1 January 2009. ^ "Brown Rat". Science Daily. Archived from the original on 31 December 2008. Retrieved 1 January 2009. ^ Robert E. C. Wildman; Denis M. Medeiros (2000). Advanced Human Nutrition. CRC Press. p. 37. ISBN 978-0849385667. Retrieved 6 October 2013. ^ Robert Mari Womack (2010). The Anthropology of Health and Healing. Rowman & Littlefield. p. 243. ISBN 978-0759110441. Retrieved 6 October 2013. ^ "Food and Diet". bearsmart.com. Retrieved 3 July 2013. ^ "About Wolves". Wolf Park. Archived from the original on 20 November 2015. Retrieved 26 August 2015. ^ Halle, S. & Stenseth, N. (2000). Activity patterns in small mammals: an ecological approach. Berlin; Heidelberg, Germany; New York: Springer-Verlag. p. 131. ^ Moller, H. (1983). "Food and foraging behaviour of red (Scirus vulgaris) and grey (Scirus carolinensis) squirrels". Mammal Review 13: 81-98. ^ Seattle Audubon Society. "Family Corvidae (Crows/Ravens)". BirdWeb.org. Retrieved 1 January 2011. ^ Capinera, John (2010). Insects and Wildlife. Publisher: Wiley-Blackwell. ISBN 978-1-4443-3300-8. ^ Ewing, Jack (2005). Monkeys Are Made of Chocolate. Publisher: Pixyjack Press. ISBN 978-0-9658098-1-8.